You should think about fertilizing watermelon after the vines begin to spread out and again when the blossoms appear and the fruit is set. You should think about watering your watermelon patch for the first few weeks after planting the seeds. 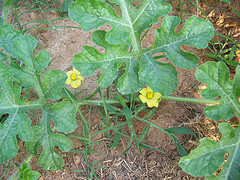 Watermelon plants have somewhat deep roots that are good at extracting moisture from the soil. Until these roots are developed, you should water the plants regularly with slow, deep soaks. For the first 3 weeks after planting, water your watermelon patch once or twice a week if no rain falls in your area. After the seeds have sprouted, scale back the watering to once every 10 days or so. When the vines begin to spread out, you can stop watering all together, as long as rain falls every 10-14 days. If you're not sure if the plants are getting enough water, dig down about 4 inches into the soil with your fingers. You want the dirt at this depth to be moist, but not wet. If it is dry, water the plants. If it's wet, let it dry out for a few days and check again. 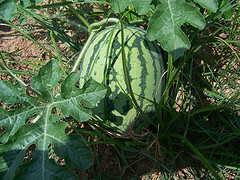 Stop watering the plants altogether about 10 days before you harvest the melons. This will allow the sugars in the fruit to concentrate and the flesh to stay crisp. This makes for much better tasting watermelon. 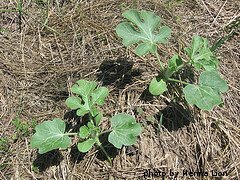 Wait until the vines begin to spread out before fertilizing your watermelon plants. If you're using a granular fertilizer, choose a balanced one like a 10-10-10 or 5-5-5. These three numbers mean that there are balanced amounts of nitrogen, potassium and phosphate in the fertilizer. Follow the manufacturer's directions for the correct dosage. Most granular fertilizers are applied at a rate of 1 1/2 pounds per 100 square feet. Scatter the fertilizer around the plants and water it in well. Make sure that the fertilizer does not come in contact with the plant, as this may cause the plant to burn. A water-soluble type fertilizer also works well. This is our method of choice, and we typically use a 1 gallon jug to mix the fertilizer and then pour it right at the base of the main stem. A second application of fertilizer can be used after the blossoms appear and the fruit begins to set. This will ensure that the plants are getting the energy they need to produce high quality fruit. In our own garden, we add fertilizer to the soil a few days before we even plant. We scatter a balanced granule fertilizer in our watermelon patch, along with some lime, and water it all in. Then a few days later, we till one last time and plant the seeds. After that, we switch to a water soluble fertilizer for the rest of the season. Now that you know about fertilizing and watering watermelons, it's time to think about harvesting them.